65. The Wicklow Line: What’s in a Name? One of the things I’m most pleased with in The Peterson Pipe book is the encyclopedia, the first of three appendices at the end of the book.Gary Malmberg (my co-author) and I probably spent more time on this single chapter than any other part of the book, because his documentation of hallmarked pipes and my documentation of every line, series, and collection found in the catalog ephemera laid the foundation for everything else in the book. Fairly early on I made an interesting discovery concerning Peterson’s line names, something you may already know. A single name can sometimes be used to describe four or five different lines of pipes, usually spread over several decades, but once in a while used concurrently. When a name is used simultaneously for two separate lines (for example, Shamrock or Rock of Cashel), I found one line being produced for the U.S. market and the other being made for a market elsewhere on the globe. Having access to the encyclopedia will help a collector pinpoint a range of years an un-hallmarked pipe he’s holding (or thinking of buying) was made. The original Aran line, for example, consisted of six oversized rusticated shapes stained coal-black, and was available in Classic Range shapes from roughly 1965 – 1975, when a second Aran line, this time in just six XL shapes, stained dark red, was released. The name has been used twice more since then, and even today causes consternation among collectors because it describes both an unmounted line and a mounted one. 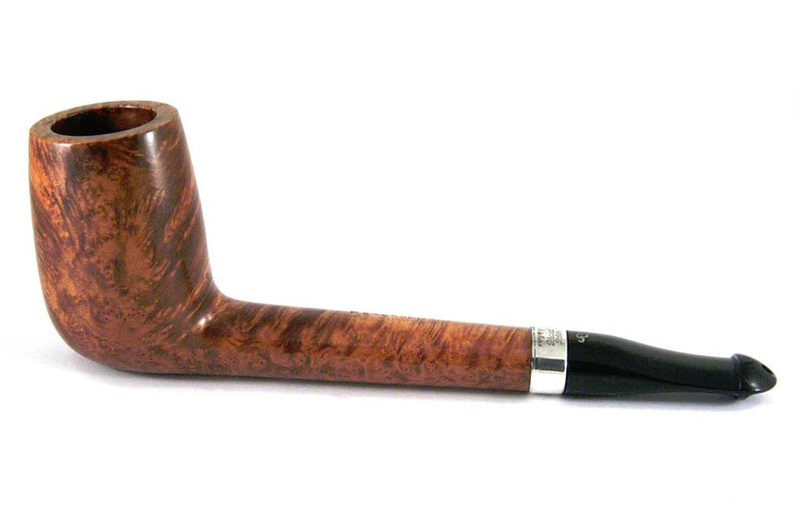 The Wicklow is a relevant illustration of Peterson’s use of line names, because just now Novelli has replenished their Peterson stock, and as usual has some of the most handsome examples you’ll find anywhere. The Wicklow name was first given to an exclusive Iwan Reis line back in 1969. 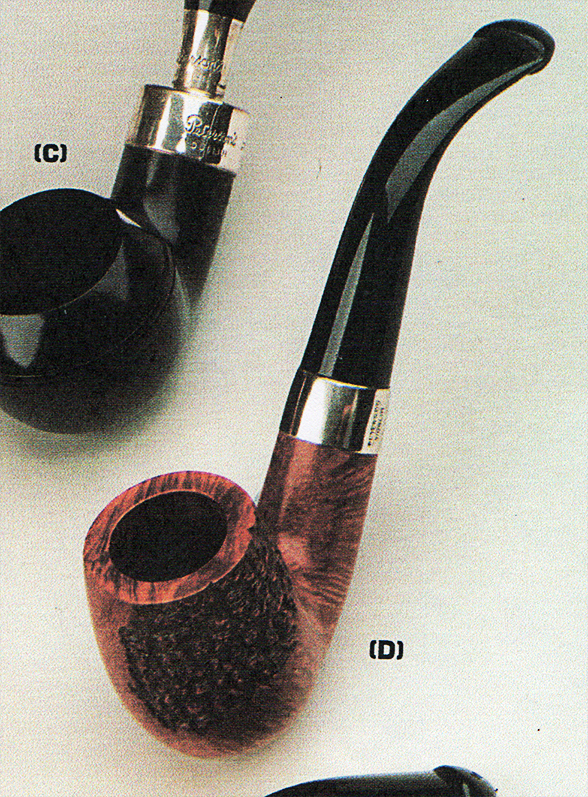 The line was unusual for Peterson in that it featured not only two otherwise unknown shapes – the “Bell Poker” and the “Calabash, Special Shape” (pictured below), but also because it featured a twin bore mouthpiece, as you can see in the photo of the calabash. IRC continued to advertise the line in their 1970 catalog, but then the name disappeared. Its $35 price tag (the same IRC customers paid for a De Luxe System) meant it was, indeed, something beyond the usual. In 1987, Peterson resurrected the line name, this time for U.S. distribution, in a smooth range of Classic Line shapes with a rusticated patch, P-Lip and nickel band. The partial rustication, dark stain, and nickel mount would place it in quality probably just below the current Aran line. The line name resurfaced for a third time in 1993, when Mario Lubinski took it up (along with a few other discarded IRC line names). * Mario again worked his magic, obtaining only the most striking pieces of briar for the Italian Wicklows. 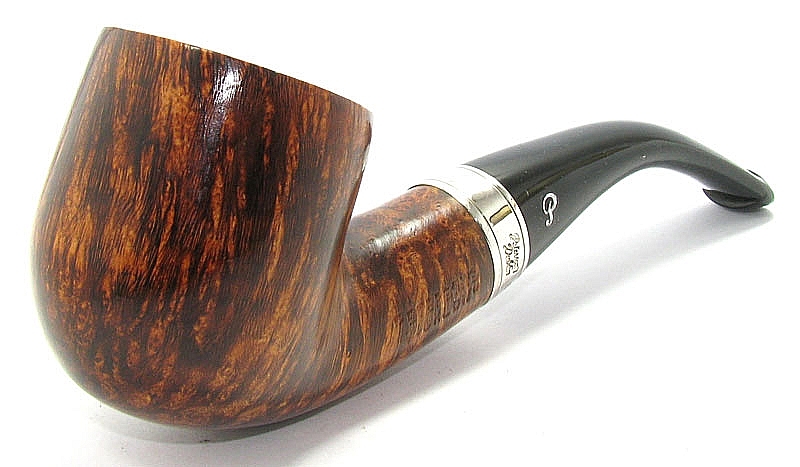 The line’s use of a sterling band is typical for Mario, but what’s unusual from an Italian perspective is that it features a vulcanite, usually P-Lip, stem. I can’t be sure, but I have a hunch it’s Lubinski’s only vulcanite-mouthpiece line. A few years ago, a fourth iteration of the Wicklow line appeared on the market, this time in the U.S. with a sandblast fishtail and nickel band. Undocumented in the ephemera I have seen, the line serves as an important reminder to collectors that Peterson’s catalog is so deep that anyone who thinks they’ve touched bottom is probably suffering from the bends. Coda: I would be remiss if I didn’t end by noting that, like nearly all Peterson lines, the Wicklow takes its name from the Irish landscape. If ever you visit Ireland, a day’s leisurely drive from Dublin through the Wicklow Mountains is a day well spent. 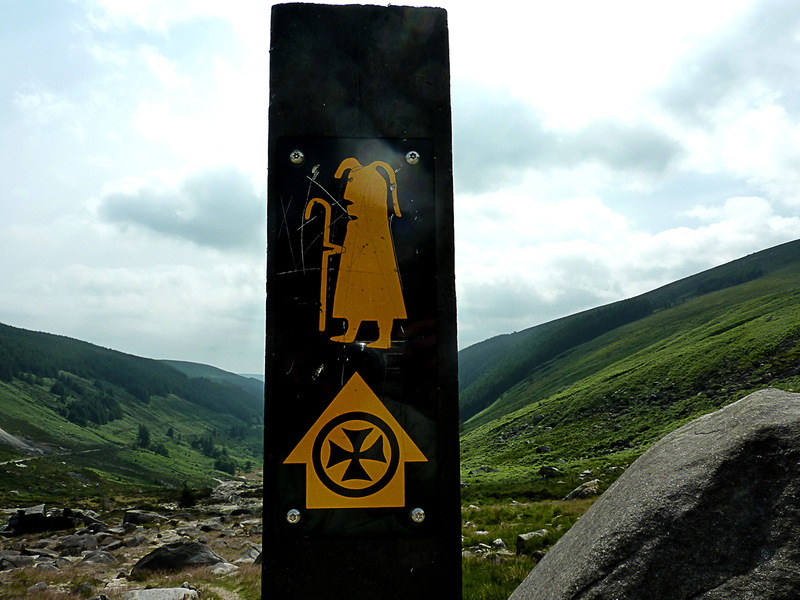 Even better for the adventurous is the seven-day hike (about 80 miles) from Marlay Park in southern Dublin through County Wicklow to Clonegal in County Carlow. Many B&B’s will pick up your luggage and have it waiting for you at the end of the day. * I have this from Tom Palmer’s recent conversation with Mr. Lubinski. I bought a Wicklow with band a few years back – XL 90 – I think it lost its way and ended up in Denmark – it was the only one of that grade in the shop. Thanks for sharing this, Jorgen. It’s always good to hear confirmations like this. The Italian Petersons are indeed something special. I have a medium apple about 155 mm long,the fishtail stem is about 88 mm.Heigh ca 35 mm. The other side: A Peterson Product – Made in England. In the stem a B and Hand finish in white dry stamping. No fills – resonable grain. Naturel to brown in colour. 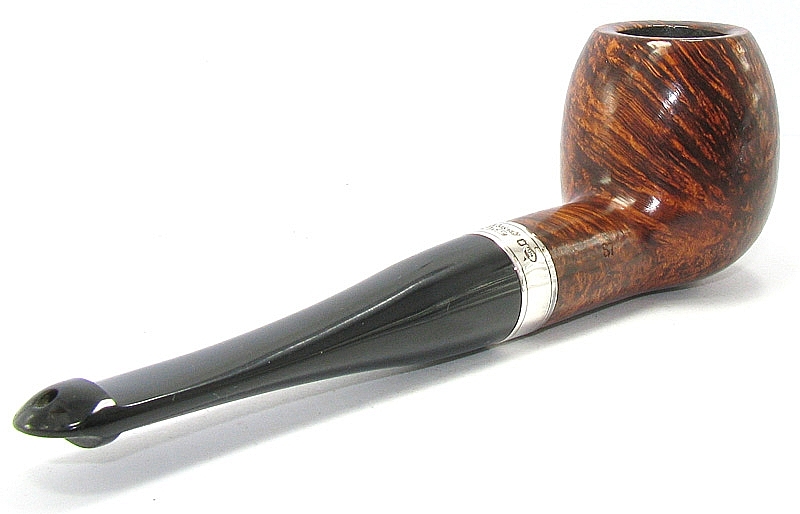 What you have is an extremely rare English-made Peterson from c. 1946-1955. The stem stamping makes it particularly rare. The origin of the line name is discussed in the book, but we’ve only encountered a handful of these pipes in our research. I forgot to mention that I got this Bradley in unsmoked condition, so its all mine.